Waist Size 28-30" Advised belt size 30-32"
Waist Size 30-32" Advised belt size 32-34"
Waist Size 32-34" Advised belt size 34-36"
Waist Size 34-36" Advised belt size 36-38"
Waist Size 36-38" Advised belt size 38-40"
Waist Size 38-40" Advised belt size 40-42"
Waist Size 40-42" Advised belt size 42-44"
Waist Size 42-44" Advised belt size 44-46"
Waist Size 44-46" Advised belt size 46-48"
Beltox Fine women's full grain leather belt 22mm solid waist belt is made of a single piece of 100% top grain leather which ensures the high quality of the belt. The belt is skinny narrow so it makes you slim looking. The color of the belt is solid, simple and graceful so it almost suits all occasions with dress, casual dress, jeans, pants and slacks and skirts. The manual work like the stitching and finish for the belt and buckle is so careful that you will feel you are the specials and treated well. You will feel rich with its full grain leather. I am sure you will get many compliments when you wear it. And your life style will be reflected by the style of the belt: simple, rich and graceful. The gift box is presented so you can send it to your mother, daughter, girlfriend or relatives, friends, of course, yourself too. You will be surprised. 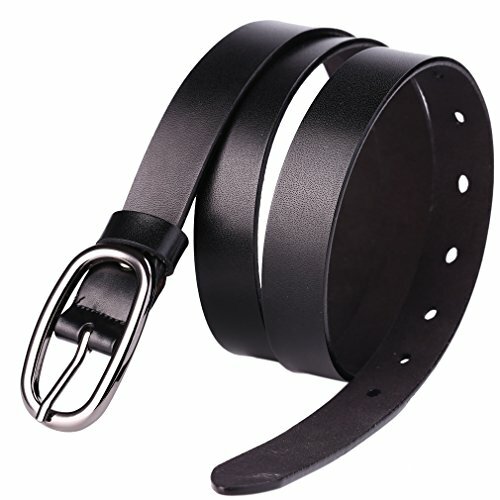 Genuine Leather Belt: 100% genuine leather belt solid color, 22MM(0.87 inch) wide for the belt, 5 holes to be plug in by the prong to secure the pants hold up. Durable for many years without split apart since it is a solid piece of full grain. Regular and plus size: the belt is sized from 28-46 size measured from the buckle end(not including the buckle) to the middle three holes. Pay attention to that it is not end to end size. Size 44-46 available too for big and tall women. Please buy one size bigger than your waist size. Target audience: women who want good quality belt for themselves or who want to send the belts as gift for women, it can be wore daily for working or casual. It can hold up dress pants, blouse, skirts, sweaters and down jacket, so no matter what season, you can wear it. Different season different clothing different feeling for the belts. Good service: 180 days free buy returns or refund, please contact seller for those services. Quality guaranteed.